SIDNEY -- A lot of farmers wouldn't let children roam their animals' pens and run with them in their pastures. SIDNEY — A lot of farmers wouldn’t let children roam their animals’ pens and run with them in their pastures. 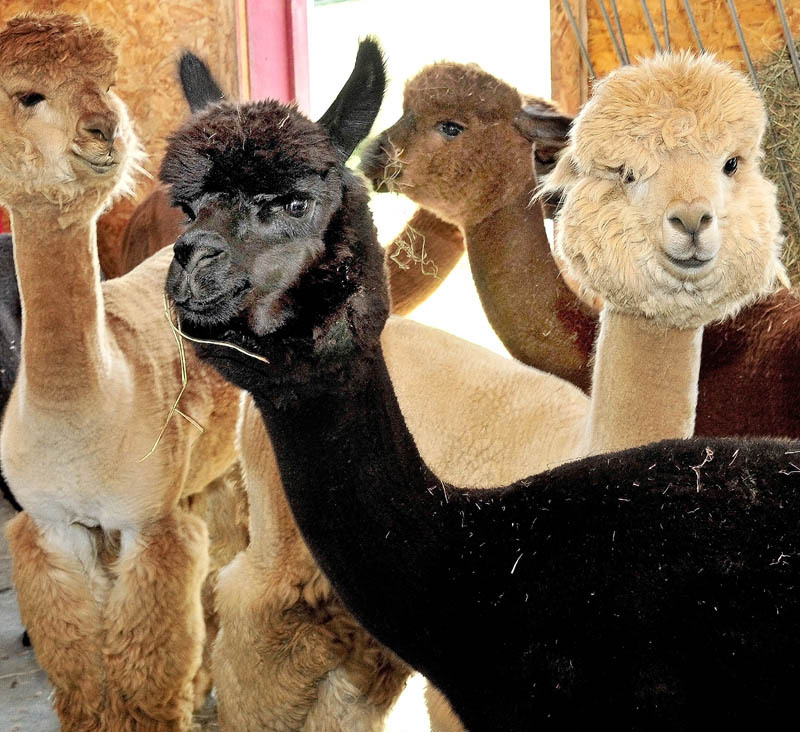 However, that was the scene Sunday at Misty Acres Alpaca Farm, off West River Road in Sidney, where the animals are docile and the farmer thrives on their positivity. Red, 65, has raised the animals for 5 1/2 years after 30 years as a self-employed contractor. He and wife, Connie, 49, started with 12 alpacas then and they’re up to about 65 now. They breed, raise, train, shear and show them. The Lalibertes and others statewide opened their farms to visitors at 10 a.m. Sunday for Open Farm Day, which started in the state 23 years ago. Connie Laliberte said this was Windy Acres’ fourth Open Farm Day. 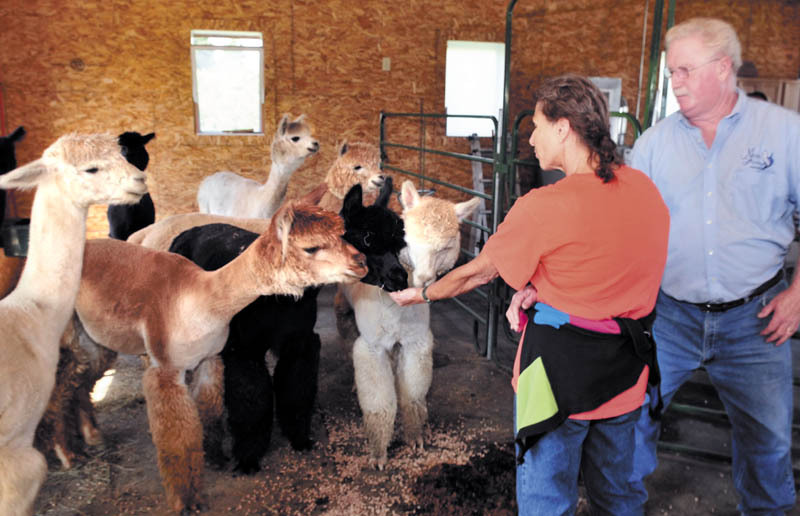 Guests could dye alpaca fiber, peruse the farm’s shop and perhaps best of all, interact with the gentle animals, which look like deer-sized llamas. Alpacas are domesticated mammals native to South America. The Lalibertes’ home and a garage stand atop a hill that rolls down to the Kennebec River. Between the home and river are eight acres of rolling pasture with 12 miles of wire for different areas for groups of alpacas. Their fiber is a valuable commodity, as it’s cottony, dense and water-repellent. The farm’s shop sells clothing items and blankets made of alpaca fiber. The Lalibertes said they make most of their money by breeding and selling animals, but they ship raw wool each year to places in the United States, Peru and Canada for spinning, carding and production. Many items sold in their shop are made from their wool. Unlike sheep’s wool, alpaca fiber isn’t prickly and is hypoallergenic because it doesn’t have lanolin, the waxy substance wool-bearing animals secrete. Connie Laliberte said it’s four times warmer than sheep’s wool. While some were there to see an uncommon animal, Dave and Judy McAfee, of Augusta, were there to pick Red Laliberte’s brain. They said they’re about to close on 64 acres on Church Hill Road on Augusta’s east side now that Dave McAfee is retired from Bath Iron Works. They want to make most of it into lots to resell, but they said they’d like to keep 21 acres for alpacas. Red was eager to share expertise, recommending starting with five to eight. Alpacas are herd animals, he said, so any fewer isn’t ideal. For the McAfees, raising the animals will be mostly Judy McAfee’s project. She said she’d researched them on the Internet before going to the Common Ground Fair in Unity. That’s where she got hooked on the animals. “I said, ‘That’s it. If I ever had the opportunity, that’s what I’d like to do,'” Judy said. Many weren’t there on business. Members of the Stein family, visiting the area from Virginia with three children, spent some time with the animals and bolted for the farm shop. According to 7-year old Katie, the family’s dog ripped the head off an alpaca stuffed animal they bought at the store last year, so they had to replace it. While she was talking, her brother, 9-year-old Johnny, was playing a game with the alpacas he said he thought up in five seconds. “They’re trying to get away from you, but your main objective is to catch them and lightly pet them,” he said. The name he gave it isn’t terribly original: “alpaca chasing.” The animals didn’t love it, but he gently wrangled a few. John Worth and wife Vicki, of Chesterville, were among the first people at the farm Sunday morning. While in the barn chatting up Red among the male alpacas, John Worth compared their docile manner to his Irish Setters. He’s not far off. Many alpacas will sniff your hand if you offer it and rub their nose on you; and if you go into their pen, they’ll probably let you pet them. Worth said he’s also interested in perhaps owning alpacas down the road.